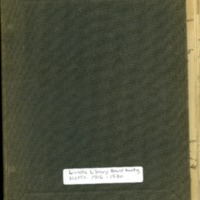 Lincoln Library Board Members, “Lincoln Library Board Meeting Notes 1916,” Lincoln Library, accessed April 22, 2019, https://medicinelodge.digitalsckls.info/item/97. A call meeting of the Lincoln Board of Directors met on above date at the City Library. President Mrs. Bucher presiding. The By-Laws read and each section adopted as read. Mis Maud Benefiel was elected as Treasurer. Mrs. McCague, Mrs. Lindley, Miss Maude Benefiel. President instructed the Finance Committee to draw up the necessary forms and blanks for the use of Secretary and Treasurer. The President instructed the Secretary to write for samples of cards and cataloging system and prices. Motion made and carried that the Library be opened to the public Wednesday afternoons of each week, Saturday afternoon and Saturday evening of each week, and Sunday afternoon of each week. Commencing November 22 and continuing through the month of January 1917 and City Librarian shall be paid the sum of $8.00 per month. Motion made and carried that the three months back salary of the City Librarian be paid. The Treasurer shall give bond to the sum of $2.00 to be approved by City Council he shall make and annual report and submit the same to the board of Directors on the Saturday before the first Monday of each month. The Board of Directors of the Lincoln City Library met on above date at the City Library. Mrs. Bucher, President, presiding. On motion we went to the home of Mrs. McCague ash she could not meet with us. Minutes of November 18 read and approved. Bill of $1.75 for book from Young Drug Store was allowed. The samples of cards received was turned over to Mrs. McCague chairman of Librarian Committee. On motion persons living outside of City limits will have to pay to the City Librarian $1.00 per year for use of books from City Library. On motion the rules are suspended and the board meetins will be held at the home of Mrs. McCague indefinitely. No further business the meeting adjourned.